Saint Maurice is i.a. the patron saint of soldiers, sword forgery and the Swiss guard. He lived in the 3rd century AD and was originally from Thebe, Egypt. This sword is depicted on a mid-13th century image on the tombstone of the holy Maurice. Possibly the tombstone is made after the sword that is thought to be the sword of the holy Maurice. The sword dates from the 12th ? 13th century. 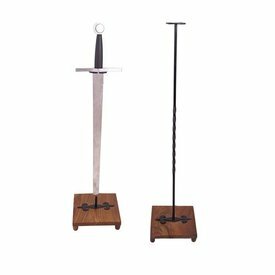 This sword was possibly used during one of the crusades and centuries later seen as the sword of the holy Maurice.The sword was kept in Turin from 1591 onwards together with other relics of the saint. Nowadays it is part of the collection of the Armeria Reale in Turin. 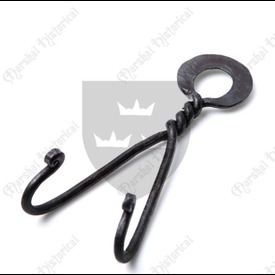 It has a Brazilian nut type pommel and a cross-guard of approx. 17,5 cm. The blade has a fuller, its length is 76 cm and it is approx. 5 cm wide. 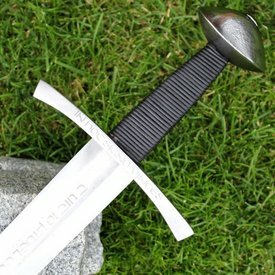 The length of the sword is 92,5 cm and weighs 1540 g.
If requested the sword can be engraved with the text ?TUITIO FIDEI ET OBSEQUIUM PAUPERUM? (defending faith and helping the poor), the motto of the order of Malta, on the blade and ?IN HOC SIGNO VINCES? (may you conquer in this sign (= the cross on the cross-guard)) on the cross-guard, or with crosses on the blade like the original.